Nick Hupton ’99 lives in Minneapolis and teaches in Bloomington. Benjamin Franklin once uttered the following on the subject of mentoring: “Tell me and I forget, teach me and I may remember, involve me and I learn.” Those are words to live by for anyone trying to make an impression on today’s youth. They are words that Gustavus alumnus Nick Hupton ’99 has embraced in every aspect of his life. Hupton is a high school English teacher at Bloomington Jefferson High School where he also coaches the boys’ tennis team. He is also a published author and is getting ready to release his third young adult novel in early September. 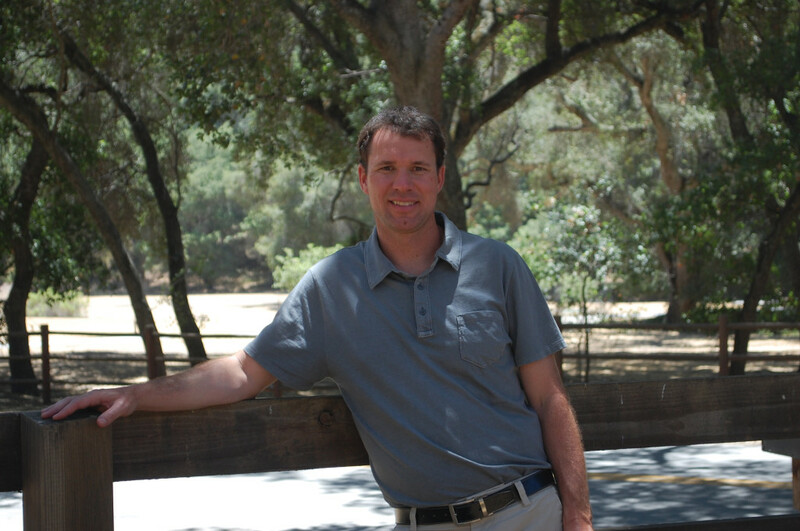 “First and foremost, I am passionate about helping kids. Watching a kid learn and grow, both academically and emotionally, is why I got into education in the first place,” Hupton said. Hupton first started thinking about pursuing a career in education when he was in high school. His mom is a teacher and his 11th grade American literature teacher had a profound influence on him, which he says fueled his passion for helping and teaching others. After graduating from high school in Des Moines, Hupton came to Gustavus to earn his undergraduate degree. Along with his academic pursuits, Hupton was a four-year member of the Gustavus men’s tennis team. During Hupton’s four years, the team won four MIAC championships, while Hupton was named an all-conference performer in 1998 and 1999. While the team’s success was something that Hupton enjoyed, the life lessons learned from the experience and from former head coach Steve Wilkinson are things that he carries with him today. 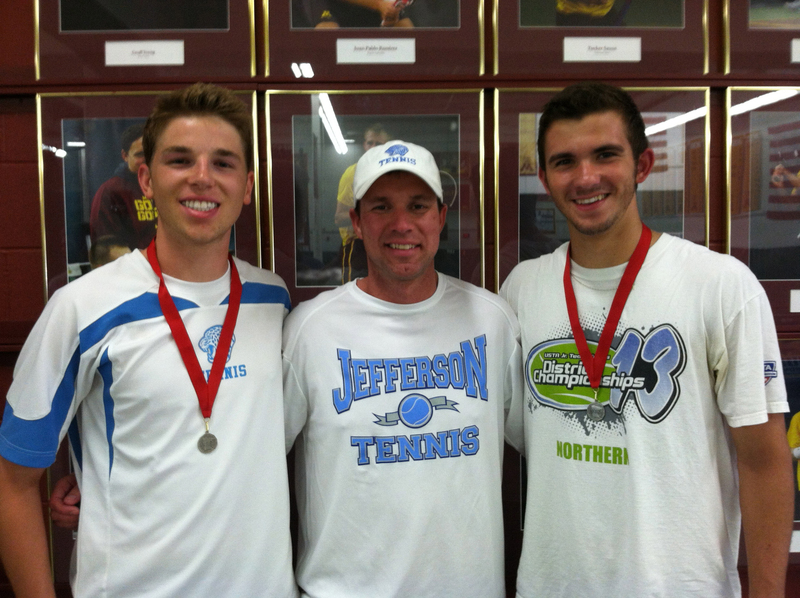 Hupton (middle) is the head boys’ tennis coach at Bloomington Jefferson High School. Wilkinson’s biography is dotted with impressive statistics such as the fact that he retired as the winningest coach in the history of men’s collegiate tennis with 923 victories. He led the College to two NCAA Division III titles as well as 35 MIAC championships. He was also recently inducted into the United States Professional Tennis Association’s Hall of Fame. But perhaps the crowning jewel on Wilkinson’s resume is the fact that he founded the Tennis and Life Camps at Gustavus which have taught tennis, life values, and sportsmanship to more than 50,000 students since 1977. While teaching and coaching in the Bloomington Public Schools, Hupton decided to pursue his master’s degree in 2008. He enrolled at Hamline University in a Liberal Studies program with a concentration in creative writing. During his master’s program he began to write what would eventually become his first published novel, If I Know It’s Coming. The book tells the story of Tim Hansen, a perceptive, but fairly average 13-year-old boy. Hansen’s mother, an Army reserve nurse is deployed to Iraq and Tim, his father, and sister Jenna, have to deal with the separation of their close-knit family. Tim goes to extremes to fill the void left by his absent mother and he is desperate to create some normalcy again. 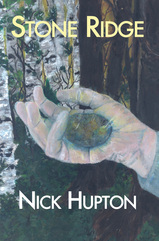 Hupton’s third novel, Stone Ridge, will be released on Sept. 5. Hupton took a group of seventh graders to Wolf Ridge Environmental Learning Center in northern Minnesota for a three-day field trip when he got the inspiration for his next book. While telling ghost stories in the woods, Hupton made up a story about an old hermit who would kidnap Wolf Ridge campers. Ten years later, Hupton turned that story into a much more elaborate and detailed novel titled The Ridge. The story focuses on Zach Sutton, an eighth grader whose brother has been missing for over a year. When Zach travels to northern Minnesota on a school field trip, he begins to piece together the disturbing truth about his brother’s disappearance. Stone Ridge, which will be released on Sept. 5, is the sequel to The Ridge. It continues Zach’s quest for his brother and his ongoing battle with the antagonist, Victor Leppla. Hupton says that both books are paranormal mysteries, but they also contain serious thematic issues such as separation, family dynamics, and good versus evil. In addition to teaching, coaching and writing, Hupton is also a husband and a father. He is married to Tara Anlauf Hupton ’00 and the couple has a son and a daughter. You can read more about Hupton’s books by visiting his website, nickhupton.com.